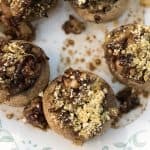 I was at a Blog Conference this last weekend, and during the Cocktail Party they had some of the most AMAZING Vegan Stuffed Mushrooms I’ve ever had. This recipe may not be exact – but it IS close, and they ARE delicious. I can see this becoming a big Thanksgiving Recipe this year….perfect for holiday parties! I used Baby Bella Mushrooms, and created a stuffing made from typical holiday ingredients – like celery, onion, sage, and rosemary. But instead of using nuts or even bread as a base for the dressing….I used a combination of white, wild, and black rice. Guys, my wife was literally eating this stuff right from the pan ! I can see the rice dish becoming a recipe all on its own. And when you stuff it inside Baby Bella Mushrooms? Forget about it. Simply Amazing. I grabbed 12 medium-largish sized Baby Bella Mushrooms from the bulk bin. Give them a quick rinse and pop off the stems. If you have trouble, a small paring knife will help to remove the stems, and I also cheated and used my grandson’s old baby spoon to scoop out the insides. Chop up the stems and set aside for now. Place the Mushroom Caps on a parchment lined baking sheet and bake for 10 minutes at 350 ° F.
When they come out of the oven, set them aside while we prepare the stuffing. In a medium saucepan, bring 1 cup of Low Sodium Veggie Broth to a boil and then remove from heat. Add ½ cup of thoroughly rinsed rice and cover. I used a combination of white, wild, and black rice. Let the rice steep for 30-45 minutes, then fluff with a fork. Meanwhile, in a large skillet, saute ½ cup white onion and 1 rib of finely diced celery until softened. Add 2 cloves of minced garlic and let that simmer for a minute, then add in the chopped mushroom stems. Stir in the sage, rosemary, and thyme and season with salt and pepper. Simmer until the mushrooms have softened, then stir in the rice. Mix thoroughly and remove from heat. Stir in ¼ cup of chopped, dried Cranberries, and 2 tsp of Balsamic Vinegar. Now try to NOT eat the whole pan, like my wife did. It IS good, isn’t it? Now simply pack a spoonful or two of the stuffing into each cooled, mushroom. I had some leftover rice so that was perfect as a side dish. Top with Vegan Parmesan and bake for an additional 20 minutes. Here is my recipe for Vegan Parmesan. It stores well and can be used in place of regular Parmesan Cheese. For all of you who are either allergic or simply don’t LIKE mushrooms…….try the rice. 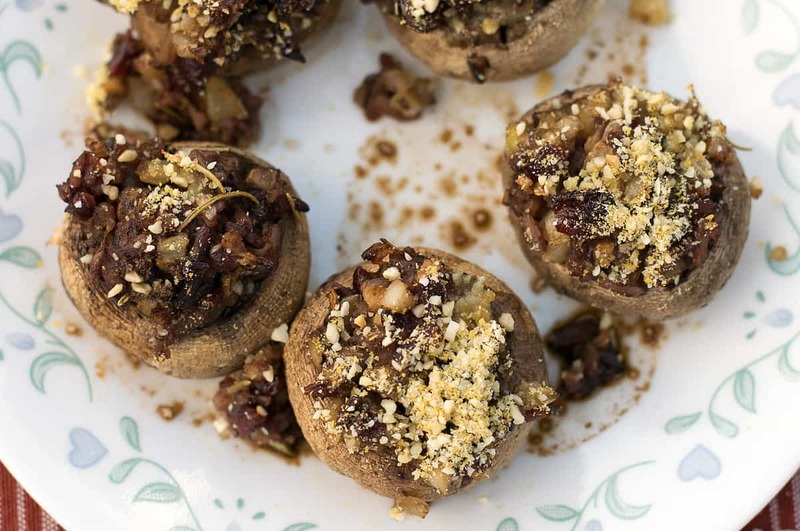 Surely a new holiday favorite, Vegan Stuffed Mushrooms. The stuffing could be a dish all by itself, but becomes magical, stuffed inside Baby Bella Mushrooms. Clean mushrooms and remove stems. Use a small spoon to make an opening large enough for stuffing. Save stems for later use. Bake mushroom caps in 350 degree oven for 10 minutes. Then set aside. Bring Veg Broth to a boil and then turn off heat. Add thoroughly rinsed rice and cover with lid. Allow rice to steep for 30-45 minutes, then fluff with fork. Prepare parmesan topping using this VEGAN PARMESAN RECIPE. In a large skillet, saute onion and celery in 1-2 Tbs of Veg Broth or Water until softened, then stir in garlic. Add chopped mushroom stems to onion mixture and simmer until softened, then stir in Rosemary, Sage, Thyme, Salt, and Pepper. Stir in cooked rice and remove from heat. Stir in chopped Cranberries and Vinegar, than stuff each mushroom with the mixture. Top with Vegan Parmesan. 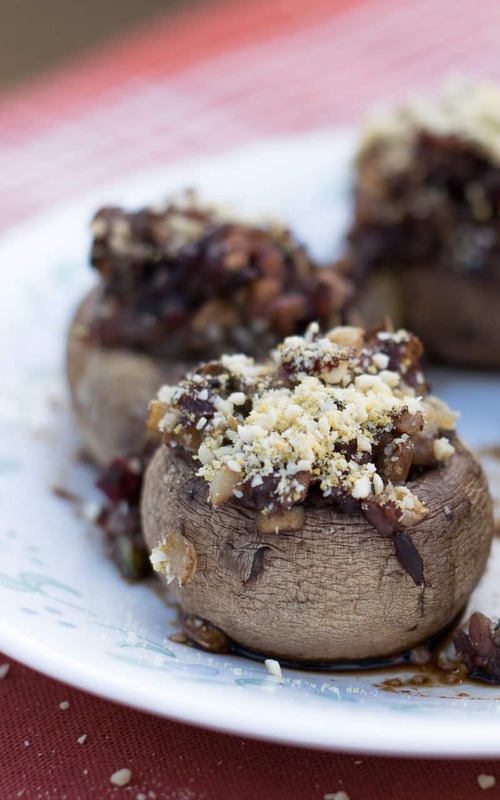 Bake stuffed mushrooms for an additional 20 minutes and serve,. Chuck, This was very tasty, thank you! The 1/2 cup rice in the ingredients section should already be cooked? No, it looks like you cook it in the vegetable broth (see step 3). I did exactly as the directions say but the rice was crunchy although still very tasty It makes a lot of stuffing so after ” marinating” for a few days in the fridge I think it did soften a little more. I trialed it last week with cooked rice and it was delicious. I actually made a huge batch of stuffing last night (recipe x5) but unfortunately got distracted and added 4x more vinegar:( Frustrating to say the least! Either way you go with the rice, this recipe is a winner for our taste buds and tummy’s! 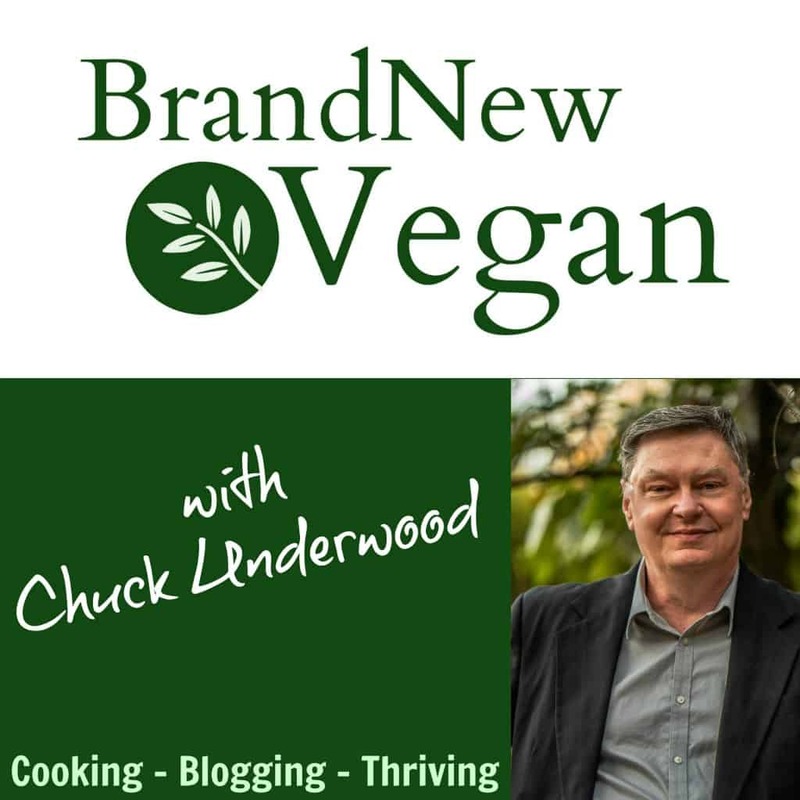 Hi Chuck, and Happy New Year! I made these last night for our New Year’s Eve dinner and I had the same problem as Sharon. The rice was grossly under-cooked.. I think suggesting using Arborio, which has a quicker cooking time, or pre-cooking the rice would be the better alternative. Also, it made WAY more stuffing than my 12 good-sized mushrooms could accommodate! I tossed in some water this morning and I’m simmering the leftovers. Seemed a good breakfast! I will definitely make these again, but I’ll cut the recipe in half. Hi Suzy. It does make a lot! I usually just get more mushrooms for the extra stuffing. So good with the faux parm!! It’s not nice to stuff a vegan into those mushrooms :)). I made the stuffed mushrooms for a Christmas Eve dinner last night and they were a big hit! I made them into a casserole, laying out the layer of prebaked, chopped mushrooms and topping with the stuffing. So good, but my wild rice in the mixture was still a bit toothy. Thanks for this wonderful (will make often) recipe! !